today I want to share some of the best, most inspiring books I have read this month. Enjoy! Helen of Sparta, the face who launched a thousand ships, was the most beautiful woman in the world. But also one of the most dull. In Greek mythology, she is portrayed as a pawn of the gods, Paris, Menelaus, or her family, without a clear will of her own. In these legends, she is a sorrowful figure. In a few, she’s a treacherous woman enjoying the carnage the War of Troy has unleashed. The Helen Amalia Carosella has created isn’t evil. And she’s certainly no pawn. She’s a fiery, compassionate, stubborn, and determined to decide her own fate. Even if it means defying the gods. Long before Paris took her to Troy, Helen was haunted by nightmares of a burning city under siege. She realised the only way to prevent this terrible war was to refuse to marry Menelaus. But both her betrothed and her family had other ideas. They refused to listen to her pleas, leaving her no option but to look for help elsewhere. She turned to Theseus, King of Athens and son of Poseidon. In the dead of night, he helped her escape, and slowly, the two started to build a life together. But, with danger and threats on any side, can Helen really escape her destiny so easily? I’m glad that Carosello decided to concentrate on her elopement with Theseus rather than her adduction by Paris. Not only it brings back to life one of the lesser known myths about Helen and Theseus, but these events, and they way they shape this beautiful woman, help us better understand the choices she will make in her future. It’s also refreshing to see the story told though Helen’s own eyes, rather than by the men in her life. Carosella knows her mythology. You don’t need to know anything about ancient Greece, its gods and heroes, to appreciate the story. Carosella provides all the background information you need, weaving it seamlessly into the pages. It helps bring Helen’s world, with its customs and traditions, forces and beliefs, vividly back to life. Some reviewers have complained about the end. It’s so abrupt that at first I wondered whether this was the first book in a series. This doesn’t seem to be the case yet, although I sure hope it wilò be. But that’s because I loved this book, and this Helen, so much, not because the end left me unsatisfied. It may not wrap up every little thread, leaving the door open for a sequel indeed. But it wraps up this particularly story sufficiently well to make the book stand on its own. If you are interested in Greek mythology, Helen of Sparta, or just a fast-paced, engaging and enthralling story full of drama and intrigue with a dollop of romance, I highly encourage you to pick up a copy. You won’t regret it. We are all born with the power to imagine what does not yet exist. What if we used that power to create the world we all dream of living in–for ourselves and others? Patrick Gaffney has collected the stories of seven amazing people who have done just that. Reva is a photojournalist who has travelled to dangerous localities to document the atrocities going on there. Sherry and Bob Jason started an arts programme to help disadvantages children living in poor and crime-rife areas discover their own potential and become caring and active citizens. Aliza Hava a singer and songwriter who organizes concerts for peace. Deeyah, a pop singer turned activist who has dedicated her life to draw attention to the plague of honour killings. Yarrow Kraner is a “gardener of genius” who connects talented young people with mentors to help them accomplish their potential and dreams. Finally Daniele Finzi Pasca, the stage director responsible for the opening ceremony of the Paralympics in Sochi in 2014, creates shows that portray the human condition in all its joy, pathos, and paradox, evoking compassion in the audience. Although it may seem that all these people were born special, different, and destined for greatness, they weren’t. They are all ordinary people, living ordinary lives who, at some point, decided they just couldn’t stand by and watch other suffers anymore. So, they started to use their talents to help them. At first they didn’t know what they were doing. Their initiatives were slow and disorganized. It took them all a lot of trial, errors, and hard work to finally figure out how best to accomplish their missions. You can do the same. Too often we stand by simply because we don’t know how to help. We’re convinced we’re insignificant and talentless and unable to make a difference. But we aren’t. Every good action, however small, can help improve someone else’s life, and the world, for the better. Let the stories of these amazing men and women inspire you to embark on a journey of self-transformation, to discover your talents, and how you can use them to help out in your community and support the causes that are close to your heart. If you want to help others but just don’t know how, pick up a copy. Actually, pick one up anyway. It’s a truly empowering and inspiring read that I highly recommend to anyone. I’ve always been obsessed with education. Education is key to the development and empowerment of caring and informed citizens, civic involvement, elimination of poverty, a bright economic future, a successful democracy, and long-term crime prevention. It’s the key to the world’s prosperity and future. But, too often, schools are failing our children. Why? 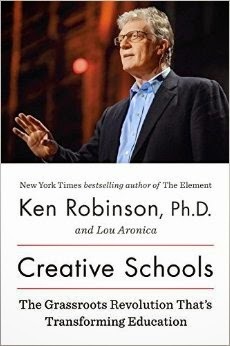 Robinson, author of the most watched TED Talk of all times, points out the problems of the current school system (the book focuses mostly on the US and UK, but a lot of it is relevant to any country), why they originated, and how to fix them. Our modern school system developed in the industrial era to satisfy the needs of that society for clerks and professionals. That’s why academic subjects were preferred. Today, we are in the information age. Employers don’t just care about what you know anymore. They now need creative people who can come up with new solutions to fix new and old problems. But creativity is often stifled in schools. That’s partly due to how difficult it is to assess. We have become obsessed with standardised tests, but these rarely measure the things that really matter. They can tell us how many facts a student knows, not the quality of the education he has received, his level of competency in a subject, or his strengths and weaknesses, such as creativity, resilience, and cognitive abilities. Standardized tests don’t work. But neither does a standardised education. We seem to think that, if we keep raising the standards and push students harder, they’ll succeed. But that’s not working. That’s because students aren’t machines. They are people. Different people learn in different ways, have different passions and interests, different familiar and economic situations, different aptitudes and goals. To allow them to learn and succeed, schools must take all these differences into considerations and provide as personalized an education as possible. Impossible? Nope. Many schools, as the book highlights, have already taken this approach with outstanding results. But it’s not enough. Every student deserves the best, most personalized, education possible. For that to happen, we need reforms at state levels. We need politicians to understand what our students really need so they can reform school accordingly. In the last chapter, Robinson explains why these reforms are so difficult to make and how all of us (parents, teachers, and citizens) can help bring them about. Insightful, informative, and engaging, Creative Schools is a must read for everyone who wants to change the school system for the better and give our children a real education to become caring, conscious, and independent adults. Highly recommended. Will you pick up any of these books? Historical Reads: Why Are Movies About Marie-Antoinette So Bad?